Professor Brian Swann continues a remarkable publishing spree with this week's release of his third book this year, with several more releases slated over the next 18 months. 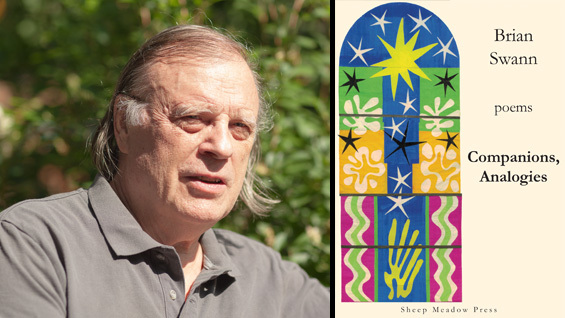 The latest work, Companions, Analogies (Sheep Meadow Press) is his 12th book of poetry following hot on the heels of his 11th such collection, St. Francis and the Flies (Autumn House), released in the spring. It won the Autumn House Poetry Prize. This summer also saw the release of Dogs on the Roof (MadHat Press), a collection of short fiction, longer fiction, nonfiction, prose poems, memoirs and essays. "Brian Swann has tailored an elegant suit of a variety of threads. It's on my A list of the blooming philosophical hybrids of the last decade," Andrei Codrescu, the author and National Public Radio commentator, has written. And there is more to come. The University of Nebraska Press Native Literatures of the Americas series, founded and edited by Professor Swann, will release a new volume by the year's end. And next year will see another collection of fiction, Not the Real Marilyn Monroe, as well as his 13th poetry book. Read our interview with Professor Swann, published in conjunction with his 10th poetry collection in 2013.